QUESTION: I was diagnosed as type 2 diabetes 2 months ago. I have not started any treatment yet, being controlling diet. Can i start taking herbal medication instead of metformin for diabetes. My doctors appointment is tomorrow monday 16/01/2012 and he will probably prescribe metformin after discussing my HBAIC results. Or can i take both, herbal and metformin? Thank you. At first, I want to congratulate you, because you are searching other natural remedies instead of drugs in purpose to handle your diabetes. However, I have to inform you that all the other remedies are reinforcing the drug treatment. In other words, the herbs, the exercises and the diet are helping the drug to put your blood glucose under control. Because of this, you have to start using herbs, along with the drugs applied from your doctor. 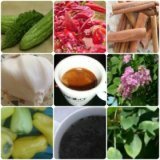 Besides this, you have to know that some of the most effective herbs on the market, used for the treatment of diabetes, are gymenma sylvestre, cinnamon, bitter melon and fenugreek. You can find every one of the mentioned herbs at the form of capsules, which you have to take according to the tips on the box. This is the most comfortable way to use these herbs for the patients, because there is no need for preparation of tea or juice, which you have to drink. However, if you want to take these herbs at the form of tea or juice, you can also take them that way. Regarding the usage of metformin, you are right that this is one of the most effective drugs on the market. However, the application of every drug depends on the particular needs of the patients, so wait for your doctor decision, because he/she knows what is best for you. Keep in mind if you are newly diagnosed with type 2 diabetes, the very first steps include changes in your diet and lifestyle together with use of glucose-lowering herbs. If this first strategy does not work, then, it comes time for the drug treatment and use the herbs at the same time. Hope that the first schedule will work for you!